What it is: Clinique's Moisture Surge 72-Hour Auto-Replenishing Hydrator is a refreshing gel-cream that gives your skin the power to rehydrate itself. 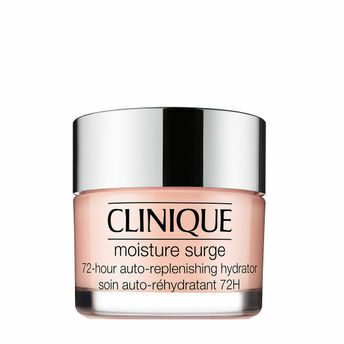 It keeps the skin almost twice as hydrated and delivers a 152% instant moisture boost. Skin appears plumped, dewy and glowing from the inside out for non-stop 72 hours. What It Does: Advanced hydrator with Auto-Replenishing Technology actually helps skin create its own internal water source to continually rehydrate itself. Then locks in all that moisture for an endlessly plump, dewy, healthy-looking glow. Key Ingredients / Technology: New Auto-Replenishing Technology with caffeine helps trigger skin’s own rehydration system. Hyaluronic Acid fragments and Activated Aloe Water plump skin with moisture. A super-holding matrix of humectants and polymers help reduce water loss and seal in moisture. Explore the entire range of Night Cream available on Nykaa. Shop more Clinique products here.You can browse through the complete world of Clinique Night Cream .